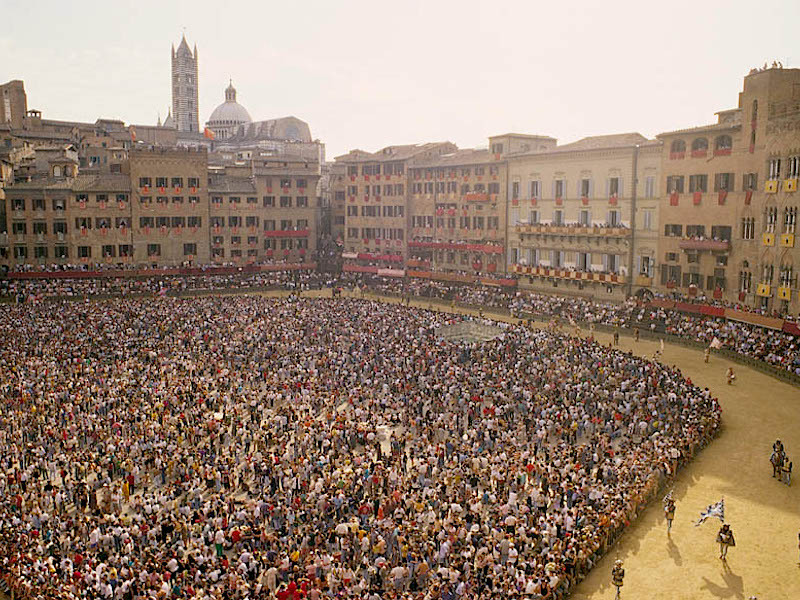 What stands behind the Palio di Siena race? It’s summer and it’s very hot, but nothing can stop the Palio di Siena race. Describing what the Palio race means for the city of Siena is pretty hard. It is something that flows in the Senesi‘s veins. People of Siena come into the world feeling already the sense of rivalry with the opposed contrade. 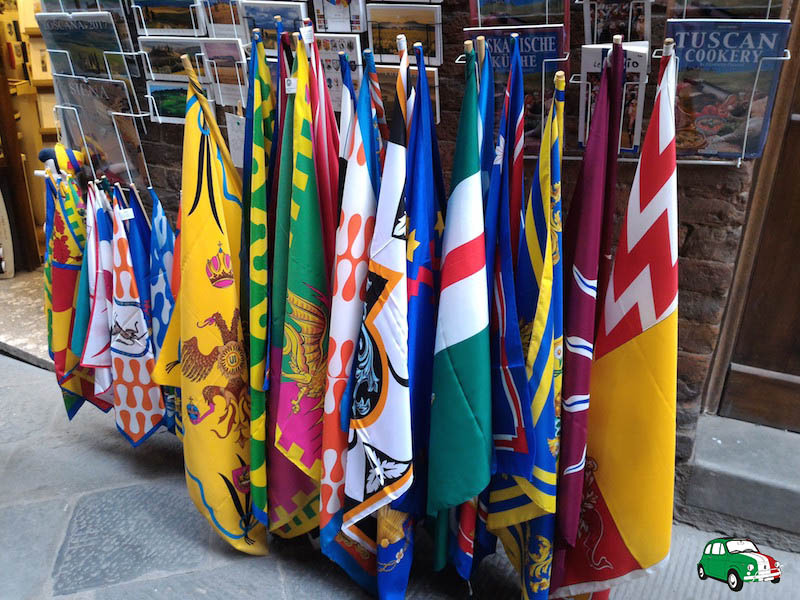 A contrada is a section in which the city of Siena is divided. The life of a Senese turns around the Palio and the preparing of this race marks the seasons. When I have been in Siena, that is one of the Unesco sites in central Italy, I have asked all the curiosities about the Palio di Siena race because I’d like to share with you what the Palio means for the city of Siena to understand what stands behind this historical event. Many people are against the race because of the abuse of the horses (they are doped! ), moreover many horses died during the race or broke their legs. A group of people claimed to picket against the Palio, but the contradaioli were ready to kick the people out. Probably you consider the event cruel now. You can believe it, but I suggest you to not saying something like this to the locals. 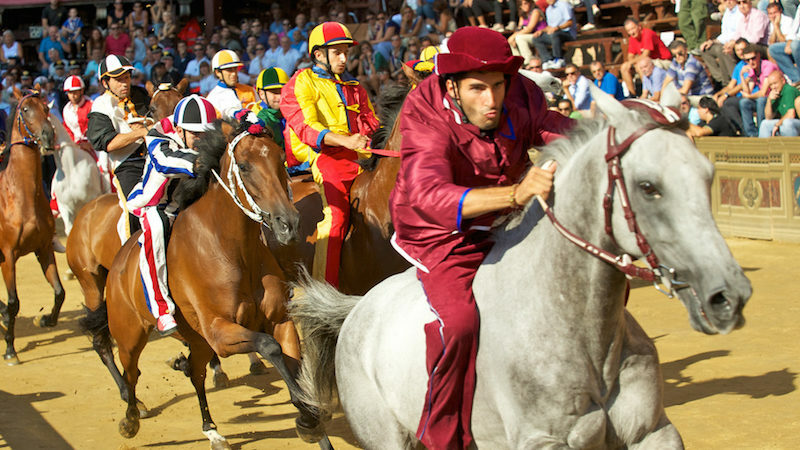 Palio di Siena is a horse race dating back to the 13th century. At that time the Palio represented the final event of the celebrations in honour of Maria Vergine Assunta, patron saint of the town and the race was on a path going from outside the wall to the Cathedral. The today’s rules of the Palio were established during the 17th century as well as customs and habits related to the horse race. But only on 16th May 1721 Siena had its definitive regulation. During the Renaissance the nobles stopped to race leaving their role to the jockeys. Palio di Siena became a show to watch, a symbol of the city’s political power. After the downfall of the Siena’s Republic (1559), the race and all the celebrations connected with it lost their politcal meaning. Gradually the Palio horse race was moved to Piazza del Campo, the most famous square of the city, where it still takes place. Waiting for the Palio horse race standing under the sun in Piazza del Campo. Palio di Siena is run right in Piazza del Campo on 2nd July and on 16th August. The first one is called Palio di Maria di Provenzano and the second one Palio dell’Assunta. And here below they are the facts of Palio di Siena. Have fun! A horse can win without the jockey, only if it arrives to the end of the race with the hackle on its head. The winner horse is called ‘cavallo scosso‘ (i.e. shaked horse). The contradaioli – people being part of the contrada – wear a fazzoletto (i.e. neckerchief) not a scarf. People start being part of a contrada when they are child or even infant. The Baptism of the contrada marks the moment when the child officially belongs to a contrada. The last time I have been in Siena I was very lucky, because I have attended to the baptism of the contrada of the Montone (i.e. ram) near Porta Romana. 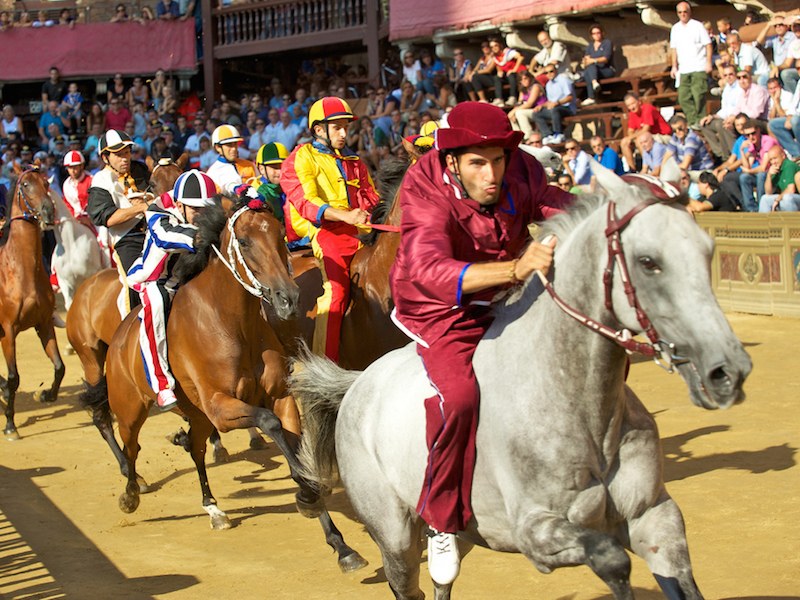 The starting line of the Palio is called ‘mossa‘. The mossiere – the man who calls the jockeys one by one – receives a letter from the municipality and he discovers the call order just before he calls the contrade. The jockeys line up on the starting line. When the mossiere decides that everything is in order he shoots a firecracker. The mossa can be valid or not. When it’s not valid, he shoots another firecracker. When the mossa is valid the mossiere quickly disappears escorted by the local Police. A car with the engine running is waiting for him. From the mossa to the car he doesn’t look anyone and he doesn’t stop. Why? Because the members of a contrada could hit him, if they believe that the position of their horse is disadvantageous or the mossiere has penalized their contrada. At the end of the race another firecracker is shot. People can see the race standing up in Piazza del Campo or sitting down on the wooden bleachers. The ticket price is 300.00 euros near the race starting line, but there are other seats at 150.00 or 70.00 euros. You can buy tickets in all the shops in Piazza del Campo. You have to book your seat in advance (January) and you can have dinner in any contrada after the dry run paying 100.00 euros per person. On the day of the race Piazza del Campo fills up. The best places are near the colonnini (little towers) all around the square. In fact the contradaioli put their neckerchief around the colonnino to reserve the space surrounding it and they sleep there the night before to be sure nobody takes their place. There are aisles to reach the centre of the square. When a contrada wins, its opposing contrada plays a joke on it. Torre and Oca are bitter enemies. Once Torre won and Oca brought some elephants in Piazza del Campo to make them bow in front of the Torre del Mangia. When Oca was the winner, the contradaioli of Torre released a lot of geese in the main street of the contrada. After the victory of the Istrice, the contradaioli walled up the entrance of a shop in their contrada because the owner was a member of the opposing contrada, the Lupa. When a contrada wins, it is organised a procession throughout the city. Every procession has a specific subject. For example in 1982 the subject was the World Soccer Championship because it was the year when Italy team won the cup. The celebration of the winning contrada ends in September with an endless table along the streets of the contrada itself. The nonna (grandma) is the contrada which has not won for a long time. After several years the nonna becomes a “dead contrada“. The last one nonna was the Torre, which had not won since 1969. Now the nonna is the Lupa. A winning jockey receives from 100.000 euros to 150.000 euros. This amount of money is collected among the contradaioli.